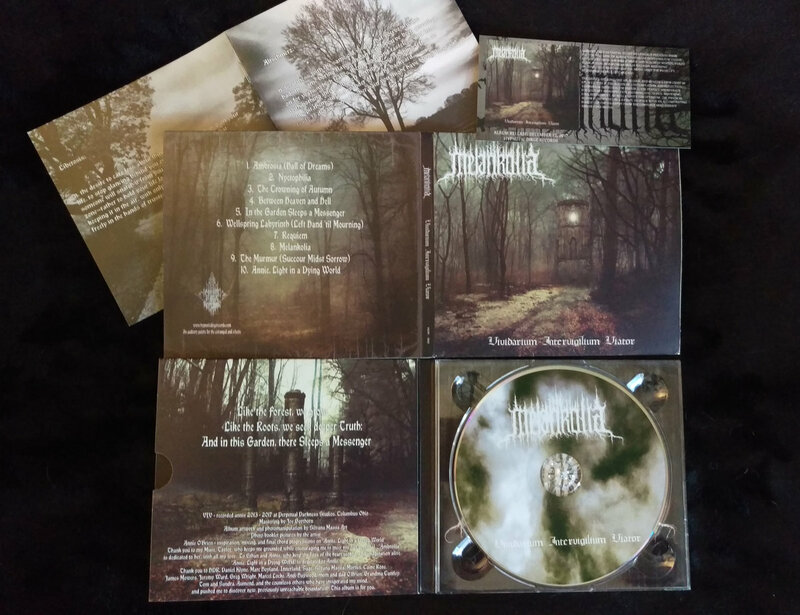 Melankolia is the dark ambient / neo-classical project of Mike O’Brien, also known for his work as Appalachian Winter, Veiled Monk and Ritual in Ash. Since the founding of his project in 2009, O’Brien has released three full length album, the last of which, III, came out in 2012 on Quartier23. Melankolia, true to the name, seeks to engulf the listener in a melancholic atmosphere. The strongest, most consistent tool in his repertoire is the piano. Often just a little field recordings and piano work is all that is needed for Melankolia to create a dark, lonely sort of atmosphere. On their fourth release, Vividarium Intervigilium Viator, Melankolia paid painstaking attention to detail, allowing the creation process to run several years longer than on any of their previous releases. The album was picked up by Hypnotic Dirge Records, a label that specializes in a variety of music, which they call “An auditory palette for the estranged and eclectic”. Unlike on previous releases, Vividarium Intervigilium Viator is completely done by O’Brien himself, with no guest musicians. Vividarium Intervigilium Viator is a diverse release. There are a number of different styles of music and mood being created here. These albums take a bit more consideration than the standard dark ambient fare, thus I’m reviewing this one six months after release, though I have been enjoying it since December. What makes this release hard to describe for a reviewer, ironically, should be just what would make listeners enjoy it. Tracks like “In the Garden Sleeps a Messenger” have sections that sound like they came right off something like Prospectus I by raison d’etre. Then, moments later on “Wellspring Labyrinth (Left Hand ’til Mourning)”, we hear an intricate texture of darker background soundscape, while synth, piano and choral voices give the track a more fantastical, ethereal feel. Then, on “The Murmur (Succour Midst Sorrow), Melankolia starts with a billowing wind and a guitar, before the piano takes over and O’Brien begins to recite an interesting passage, I assume of his own creation, which talks of the woes and disappointments of human existence. In all these different sorts of tracks, Melankolia keeps the theme and mood directed consistently toward his goals. The heavy use of field recordings throughout the album adds greatly to its contemplative, melancholic nature. The piano parts all hold an emotional edge, and are reasonably diverse, in opposition to so much of the neo-classical styled dark ambient we hear which incorporates the piano, but not in any skillful or complex sense, often allowing several notes to repeat throughout, never using any actual scales or chord progressions. Not that most of that is bad, I enjoy many of these sorts of tracks, but it feels more authentic with Melankolia than with many of the other examples I’ve heard over the years. This music is perfect for long lonely nights, sitting by the window reading, watching as the seasons pass, time slipping irretrievably through our fingers. The name Melankolia really tells the tale of this artist’s style. He treads that ground between dark and “regular” ambient very lightly. The album evokes a sadness, but of an indirect variety. We aren’t left imagining lost childhoods or ended relationships. We are not given such a direct sensory nudge. Instead the music leaves me feeling almost content in my solitude. It is that sort of calm darkness that one finds when all is pitch black, but a single burning candle or night-light. A sense that all the surrounding woes and hardships are fleeting, as are our own fragile lives. I would highly recommend this release to anyone into the neo-classical side of the dark ambient spectrum. There will be quite active moments throughout the album, but they rarely if ever disrupted me when I am focusing on some other task. The heavy use of field recordings makes this a true pleasure as well, really adding a depth to the sounds of your environment, and their emotional pull on you. Hypnotic Dirge Records released the album in a beautiful 4 panel digipak with an eight page booklet of photography and thought provoking written passages. O’Brien really put together a polish gem with this one. We should definitely be keeping our eyes and ears open for whatever is to come next!